After two straight tough road losses, the Rams ride Ben Onek's talent to gain a needed victory against South Portland. SOUTH PORTLAND — Ben Onek took a seat early in the second quarter after a slight twist of his ankle Friday night. 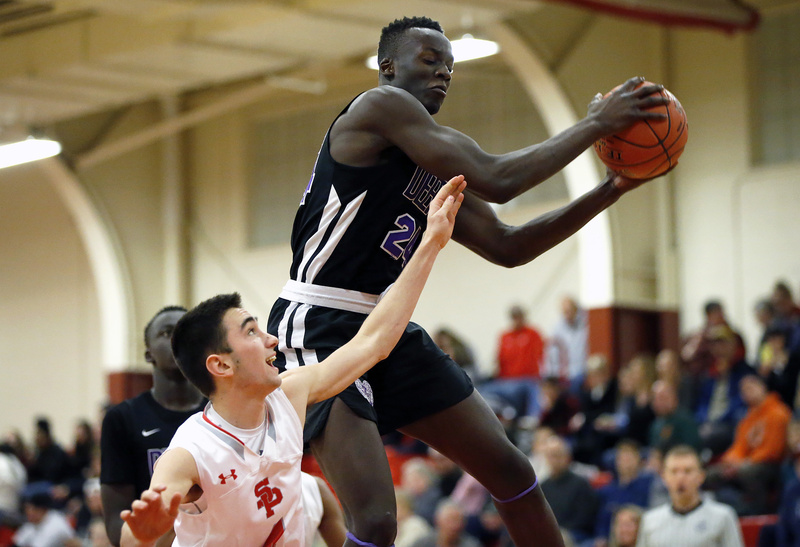 Watching his counterpart from South Portland, 6-foot-7 Scott Lewis, hit an uncontested 3-pointer to give the Red Riots a six-point lead was just the right medicine for Deering High’s standout senior in a Class AA boys’ basketball game. Deering’s Ben Onek passes to a teammate under heavy pressure from South Portland. Onek quickly got out of his seat, returned to the game and turned in a superior stretch of all-around play, leading to a half-ending 16-3 run and Deering being in control the rest of the way for a needed 50-41 win. 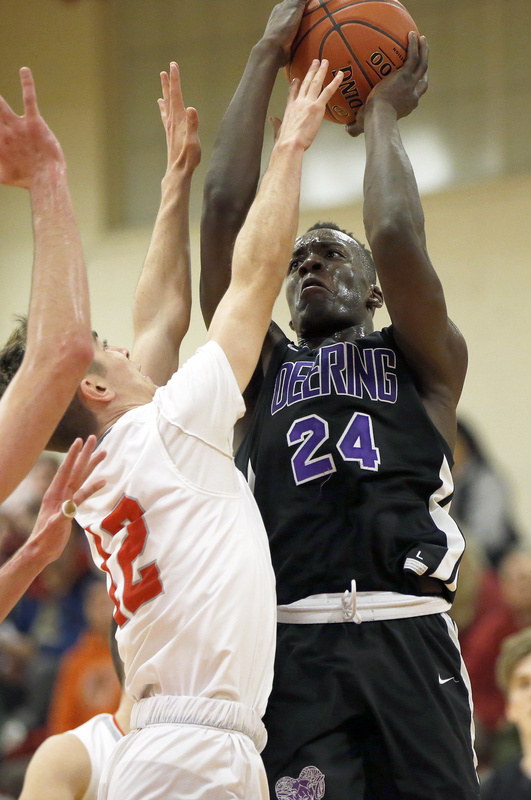 Deering (7-5) was coming off close road losses at Bangor (47-42) and Edward Little (63-61), the top teams in Class AA North. “This was going to be a gut-check game,” said Coach Todd Wing. Deering’s Ben Onek takes possession of a rebound on against South Portland. South Portland (7-5), which lost 53-40 at Deering in the opener, had won two straight since Lewis returned after missing five games with mononucleosis. Lewis led the Red Riots with 15 points and seven blocks, but the team was without starter Geremi Baez, who has an ankle injury. Onek scored a game-high 21 points and made contributions at both ends. In the second-quarter run, Onek twice blocked Lewis shots, and his rebounds and outlet passes led to two Loki Anda fast-break buckets. 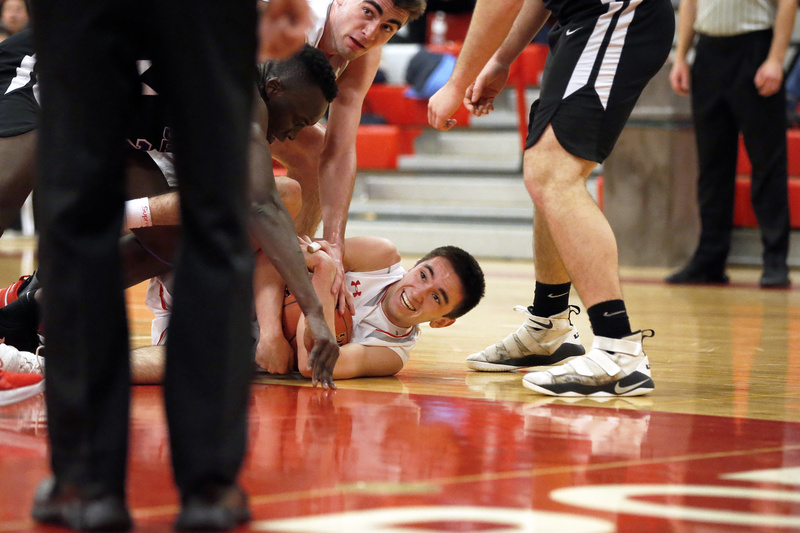 South Portland’s Ryan Boles awaits the referee’s whistle after gaining control of a loose ball. 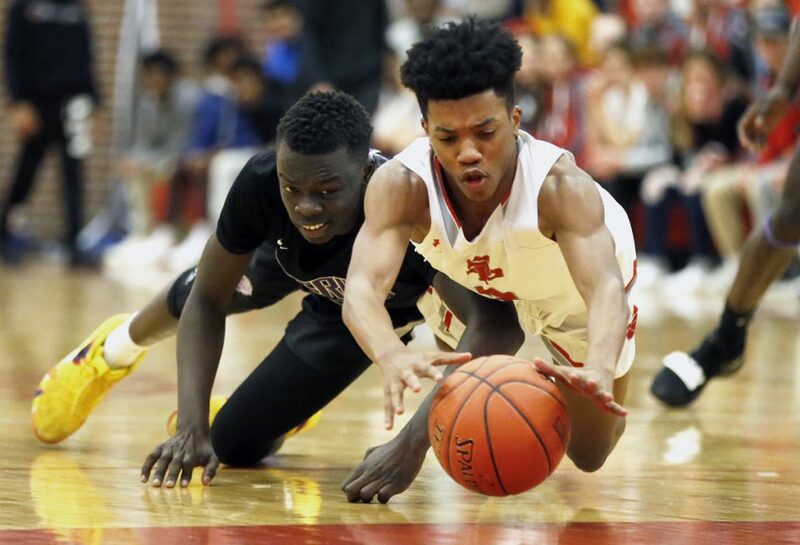 “Last year I wasn’t really a great defender at all, and I knew if we wanted to win against good teams like this I’m going to have to step up and play defense like I should be doing,” Onek said. Onek scored nine points in the second quarter, showing his repertoire with a dunk, a pull-up 3-pointer and a power put-back of his own . In the fourth, Onek helped shut the door when he answered consecutive 3-pointers from Lewis and Luca Desjardins with baskets of his own. Down the stretch, Germain (11 points) effectively controlled tempo, making sure Deering would post the win.